One contemporary handdrawn map of the siege has survived. The Siege of Groenlo took place In the summer of 1627. It was one of the first achievements of stadtholder Frederick Henry, after he succeeded Maurice in 1625. At the 19th of August, the fortified town in the county of Zutphen, occupied by the Spanish, had to surrender after a siege of a month. One contemporary handdrawn map of the siege has survived (COLLBN Port 11 N 224). This map is interesting from a historical and cartographical point of view. Not only the town, but also the surrounding area is visualised on this fortification plan. The most prominent feature on the map is the circumvallation investment around the town. This line consisted of an earthen rampart with a ditch, a number of fortifications and two military camps and was constructed by the States army in a circle of about 3 kilometers around the town. The small river Slinge also played an important role during the siege. Frederick Henry and his army wanted to build a dam (indicated on the map with the letter Q) to break the water supply to the town and to inundate the surrounding area. The Spanish occupiers needed the water for the town canal. Map collector Johannes Tiberius Bodel Nijenhuis attributed this map, in the margins, to Frans van Schooten, a professor of fortification engineering in Leiden. 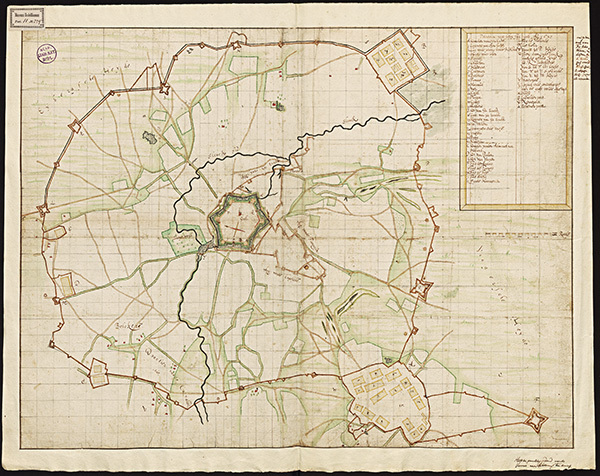 However, it is more likely that the map was drawn by Theodorus Niels, a staff member of Frederick Henry who was in charge of the fortifications. The map strongly resembles with the printed map of the siege in Hugo Grotius' publication of 1629 on the siege. This work was published by Willem Jansz. Blaeu. Later the map was included in the town atlas of son Joan Blaeu. On that printed map Niels is named as its maker. The only small differences are the roads outside the line, that are extended on Blaeu's map. However, it is not impossible that Van Schooten also played a role in the construction of this map. During the summer period, when there were no lectures in Leiden, he joined the army as military engineer. Probably, the pencil drawn grid indicates that the manuscript map modelled for Blaeu's copper engraving. In recent years, a great re-enactment event is organised to commemorate the siege.